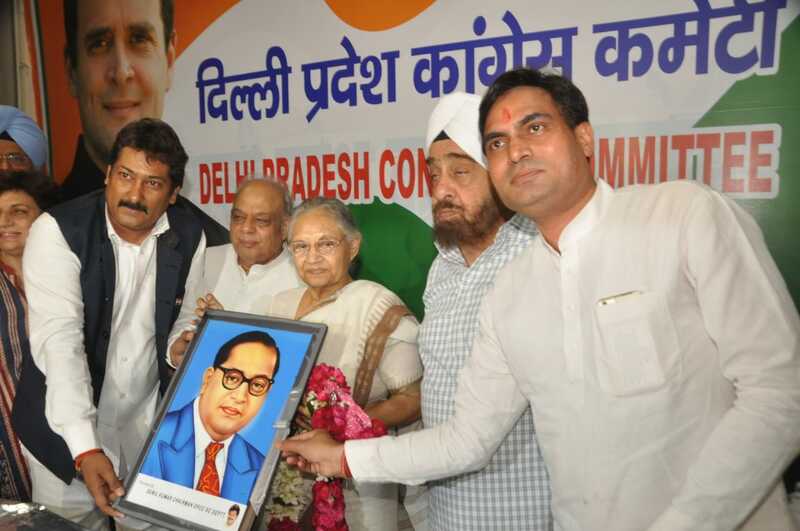 New Delhi: Delhi Pradesh Congress Committee president Sheila Dikshit offered floral tribute to Bharat Ratna Dr Bhim Rao Ambedkar on his 128th birthday, at a function organized by the Delhi Pradesh Congress Committee SC Department at the DPCC office. At the function organized to celebrate the Ambedkar Jayanti at the Rajiv Bhawan, Congress leaders and workers offered floral tribute to Dr Ambedkar and recalled his yeoman service to the country, the marginalized people in particular. The function was organized by chairman of the Delhi Pradesh Congress Committee SC Department Sunil Kumar. A cake was also cut on the occasion which was distributed among those present. Besides DPCC president Smt. Sheila Dikshit and chairman of DPCC SC Department Sunil Kumar, prominent others who attended the function were DPCC Working Presidents Haroon Yusuf and Rajesh Lilothia, AICC secretary Tarun Kumar, former Delhi Ministers Mangat Ram Singhal and Ramakant Goswami, who is also the spokesperson, Dr Kiran Walia, Dr Yoganand Shastri, former leader of the House in the MCD.